Halifax is growing. There has been more intensive development in HRM in the past two years than at any time in the past three decades. The downtown core is transforming with business and residential developments rising in every corner. Major investments in public infrastructure are being planned for the Cogswell Street Interchange and over the next decade Halifax Water will be spending billions upgrading water and wastewater capacity. This economic activity provide great benefits, however there are unintended consequences. The impact of this development is creating significant economic hardship for small businesses adjacent to these major projects. When finished, these projects should benefit these businesses. Residential and business developments will provide higher concentrations of foot traffic and a source of customers, infrastructure upgrades will provide additional capacity and allow for increased population density..
Over the past months however, CFIB has heard from many businesses struggling to survive while these projects are being completed. The impact on the Argyle Street business has been horrendous. Revenues at businesses already operating with razor thin margins have plummeted. In Eastern Passage, the Halifax Water upgrades have put many adjacent businesses on the verge of permanent closure. There are many other examples dotting the landscape. 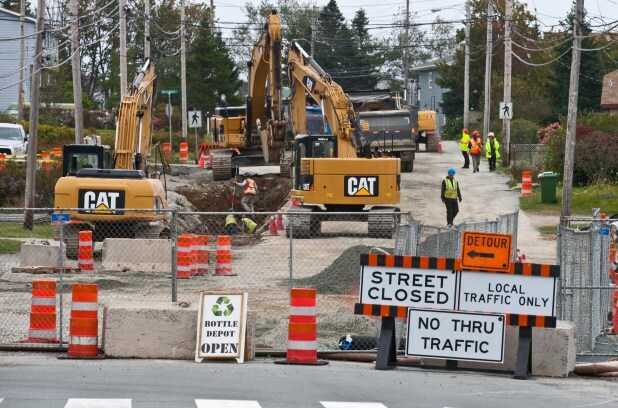 On the municipal website it states clearly that HRM does not entertain Loss of Business or Business Interruption claims as a result of construction projects. The city is responsible for issuing permits for development therefore it should also be the city’s responsibility to make sure small businesses are not suffering unreasonable harm as the result of its decisions. This means more clarity and better communication for both the contractor and affected businesses. Entrepreneurs in the retail and food services sectors depend heavily on foot traffic, appropriate parking availability and a reasonable environment to conduct business. As a vitally important part of the municipal tax base, HRM would be wise to look at the adoption of a robust construction mitigation policy to make sure these businesses can continue to run or at least give them a reasonable heads up so steps can be taken to mitigate their own losses. Construction mitigation refers to the measures that cities take to counteract the negative effects of construction. The most important responsibility of government is to ensure businesses are aware of the size and scope of projects well ahead of time. The city also has a responsibility to make sure contractors take into account the direct and indirect impact projects have on surrounding business, especially small businesses dependant on customer access. HRM must also address inappropriately high encroachment fees on developers. Questions need asking about how much money is charged to developers who have to offer access to sidewalks during construction. These fees need examination. By definition, they should be levied only on a cost recovery basis. That means charging only for the administrative costs and this should be done far in advance of any pedestrian or vehicle traffic disruption. If these are indeed fees, consideration must be given to reinvesting this money into providing adequate consideration to surrounding business or reducing the cost to developers so they can invest in better construction mediation efforts. Some cities relax zoning laws to permit business signs in places normally off-limits; others relax parking requirements. Others require contractors to put up signs noting business are open and accessible. In the US there are cities that underwrite business-specific construction-based advertising up to $500, or subsidize sale discounts. Others are even more creative entering all visitors to traffic-affected businesses in merchandise raffles or other direct incentives. The cost is not high, but it’s a clear sign the city governments care about small business. The most important piece is effective communication with affected businesses. This doesn’t simply mean sending out a letter a few days in advance outlining when and where work will be done. It means ensuring contractors and authorities understand the impact on a small business and taking steps to mitigate disruption. It’s the difference between saying our city is small business friendly and doing something to prove it. Next PostNext Want to help entrepreneurs? Make Nova Scotia a leader in regulation again, and make it the law.